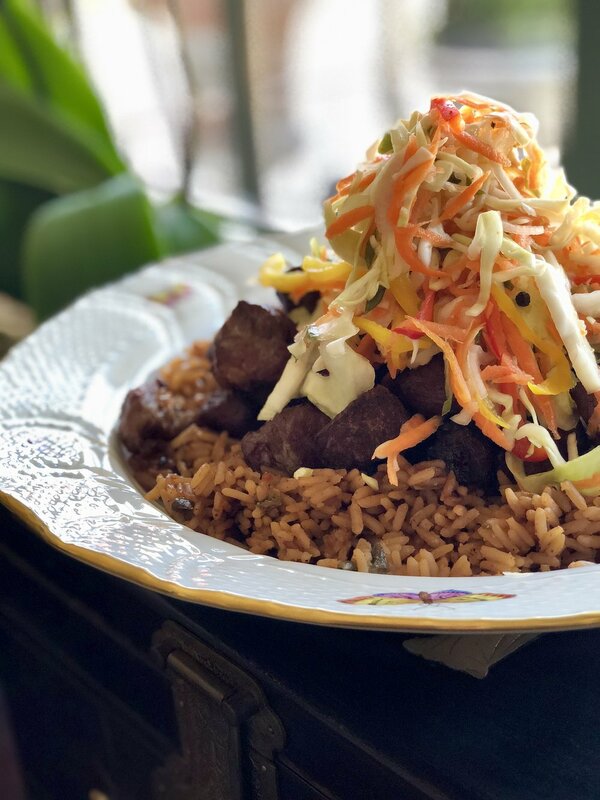 I had never tried making griot and pikliz before but have been around it and eaten enough of this magical Haitian dish, that I felt was time to dive into the magical, tropical, waters and give it my best shot. It was fantastic! Griot is very traditional in Haitian cuisine and tradition and can be found in where her there is some sort of celebration happening. Weddings to funerals, births to housewarmings, griot and it’s friend pikliz go hand in hand. Meaty chunks of boneless pork shoulder are marinated in bright citrus juices. Combined with the punch of spice from Scotch Bonnet/ Habanero peppers, that additional flavors of garlic clove, bell peppers, and vinegar make each bit a delectable taste of the Caribbean. Now, combine that with the sharp and peppery pickled cabbage, carrots, scallion, and more citrus juices that is “pikliz” then you have a delicious dish, made from love, and is nothing more than down-home nations soul food…straight from the heart. Like most traditional dishes in any cuisine, ingredients and cooking methods vary. My versions of griot and pikliz may be different but the flavor, care, and spirit are none-the-less from the tradition of the two. As far as deep frying the griot well that is up to you. The Persian in me wants to grill or broil the pieces of pork, and I am not opposed to that idea. If you so choose to grill and not deep-fry PLEASE let me know how it turned out. I would love to know. When it comes to the Pikliz (Pik-Leez) we’re basically making a pickled coleslaw. Not pickled in the traditional sense or fermented… just a nice quick pickling of fresh crunchy ingredients with a hint of spice and spices! Combined the two together on a bed of rice and it’s pure magic! Perfect for dinner parties or any gathering! You'll be glad that you wore gloves! Put on those latex gloves! After cutting and dicing habanero peppers you will be glad that you wore latex gloves. Trust me. Begin by seeding and dicing all of your peppers. The heat from peppers (Capsaicin) is located in the seeds and the inner membrane or pith oil the pepper. You may use one habanero instead of two… or three instead two if there are varying degrees of heat you and yours prefer. Place the seeded and diced peppers (all of them, including the red and green bell peppers) into a large non-metal mixing bowl. 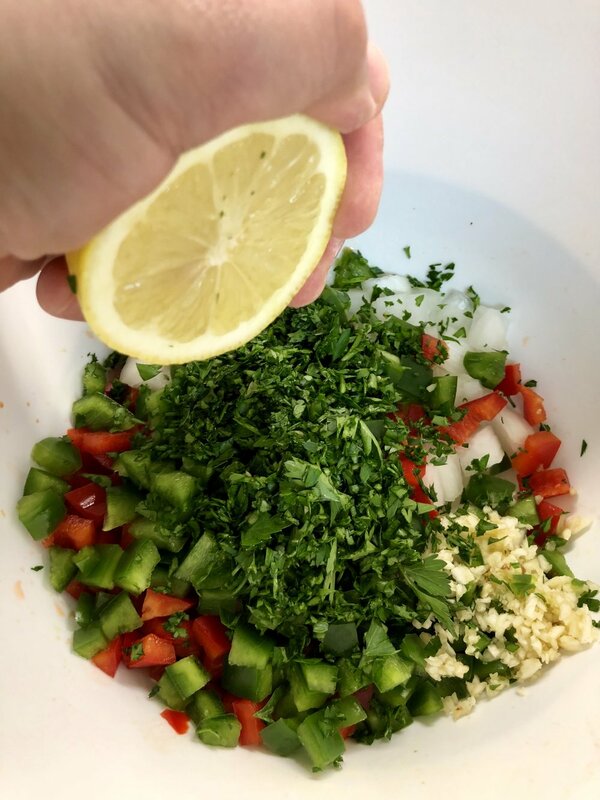 To that bowl add the diced onion, garlic, chopped parsley, and thyme. Next add in the juice from the orange, lemon, and limes followed up with the cider vinegar and Worcestershire sauce. Mix everything to combine. Next add in your cubed pork meat. Toss the meat into the marinade. Season with Cook’s Line Seasoning and add the coconut oil. Toss it one more time ensuring that the meat is fully coated and covered in the marinade. Cover the mixture in plastic wrap where it's actually flush with the marinade and meat. Add something heavy onto there top ensuring the meat is fully submerged in the marinade. Chill in the fridge at least 5 hours or overnight. When you’re ready to cook, pour the entire contents on to a large non-reactive metal pot. Bring the mixture to a boil then back down to a light simmer. Cover and cook for least 30 minutes. Pour the cooked mixture through a strainer either discarding the cooked marinade or saving t for broth or soup for later. Pour the cooked pork and contents out onto a paper towel lined cookie sheet and dab dry. If frying these and not broiling/grilling, water and hot oil will not mix. Make sure the eat is fairly dry before frying. Begin heating 3-4” of oil into a heavy bottom pot, or your in-home deep fryer. Once the oil is around 360 degrees began to carefully drop 5-6 pieces of pork at a time and fry until golden brown. Fry in batches until all are golden brown and cooked. To serve, place on top of cooked brown or white rice, red beans and rice, or any type pf cooked grain you prefer. Always serve with “Pikliz” to add that extra punch of tang, crunch, and spice! In a bowl combine the cabbage, both peppers, carrots, onion, garlic, green onions, Cook’s Line Seasoning, whole cloves, and lime leaf if using. Toss to combine. In 2 large quart jars, pack the vegetables inside the clean jars. In the same mixing bowl combine the vinegar and lime juice. Swirl it all around collecting any seasoning and veggies that may have been left behind. Pour equal amounts into the jars. Push the vegetables down carefully to ensure their coverage of the liquid. Secure with the lid’s top. Refrigerate at least a few hours to overnight. Serve crisp and cold with hot Griot and Rice.